Almost two years after the Atlantic Institute for Market Studies (AIMS) report Education on Wheels was released, New Brunswick decision-makers are still spinning their wheels. Few among the New Brunswick political class noticed that our report, released in January 2015, was subtitled Seizing Cost and Energy Efficiency Opportunities in Student Transportation. Instead of seizing the initiative to control student transportation costs that consume up to seven per cent of the education budget, policy-makers became sidetracked in a time-consuming, fruitless debate over dual busing services. As the lead author of the first comprehensive review of Atlantic Canadian student transportation, it was disappointing, to say the least, to see two N.B. cabinet ministers pluck one recommendation, rip it out-of-context, and turn the whole public discussion into a test of the province’s commitment to duality in student busing. Spending almost two years pursuing a court reference to curtail one rural area (Kent County) involving eight buses out of 1,200 in the province and affecting only 92 students speaks volumes about misplaced priorities. The only real benefit was to raise the profile of law professors seeking to turn this into a test of French linguistic rights. Now that the New Brunswick government has wisely abandoned its court quest, it’s time to get on with tackling the bigger issues, most of which can be done without venturing into that political minefield again. Under a new provincial policy, district education councils can secure better deals on bus services for local ratepayers and reinvest the savings where it counts – in the classroom. To suggest that the recent decision means the status quo remains in place is indefensible. The AIMS report shows that shared administrative services, contracting out and energy efficiencies could save New Brunswick taxpayers millions in the years ahead. Leaving aside dual busing, our report revealed that the number of school buses in N.B. increased to 1,237 in 2014 from 1,156 in 2009, even though the total student population declined to 74,055 from 85,000 during that time. 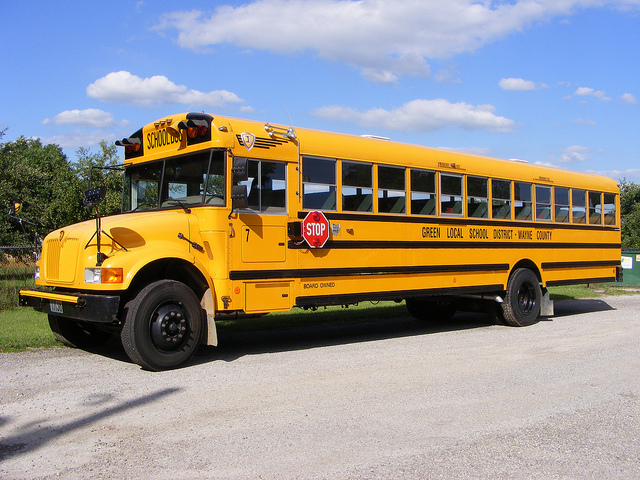 Unlike other provinces, over 90 per cent of the province’s school buses are owned and operated by the government. There is little or no integration or shared agreements with municipal transit services. The entire system is grant-driven, without any real competition to help drive lower costs. New Brunswick student transportation costs, we found, were largely driven by capital replacement cost recovery and government employee contracts, with little or no private contracting. Consolidating schools only compounds the problem by extending daily routes and adding incremental costs. If student transportation research in Ontario and Alberta are any guide, the absence of competitive bidding for bus contracts, over time, results in higher per student costs that take bigger and bigger bites out of education budgets. Since the late 1980s, leading Canadian school boards, beginning in Ottawa and York Region, have, on their own, created regional transportation authorities. Since 2006, all of Ontario’s 72 boards have integrated, shared bus services, managed by 22 consortia to contain costs and achieve energy efficiencies. Mounting provincial deficits and tightening education budgets suggest New Brunswick and its school districts should look first to educational support services for cost savings. There’s much to be achieved in student transportation reform without compromising student safety. Combining government-run and contracted services, and providing incentives to form joint transportation service authorities is a proven success, as demonstrated in Alberta and Ontario. Then the harder work begins in implementing improved cost management systems and a whole range of practices based on advances in data collection/analysis, route scheduling software, energy efficiency and improved point-of-service operations. Once these initiatives are underway, regular provincial audits will be needed to benchmark and track student transportation service levels. New Brunswick has lost almost two years embroiled in a totally fruitless constitutional wrangle. It’s time to set aside the legal briefs and achieve cost savings, generate energy efficiencies and truly model active student transportation. Paul Bennett, Ed.D., is director of Schoolhouse Consulting, Halifax, and co-author (with Derek M. Gillis) of the 2015 AIMS study entitled Education on Wheels.